Many design participants believe they cannot draw. To be honest, I believe that about myself. People who feel they cannot draw tend to extend that belief to encompass design sketching, as well. However, I have learned to distinguish between drawing (below, left) and sketching a software design (below, right). Software design does not require drawing, only sketching. From experience, I can tell you that sketching is easy once you realise that the goal is to produce only rough and low-fidelity ideas, not decorative and high-fidelity pictures. Occasionally, I encounter a design participant who has trouble with sketching. I once had a participant who was so self-conscious of her sketching ability that she was paralyzed during the rapid iteration phase, when the design participants are quickly mashing up the sketches with borrowed and new ideas to produce additional sketches. I noticed that this participant was always busy—talking or wiping the board or replacing the snacks—but never sketching. This avoidance, and the underlying mental block, was an impediment to the whole team. Like all generative design processes, Five Sketches™ relies on its participants to saturate the design space with ideas. If a participant isn’t participating, it increases the project risk. 10 seconds to sketch a cell phone. 8 seconds to sketch a sandwich. 6 seconds to sketch an airplane. 4 seconds to sketch a ship. 2 seconds to sketch a house. After each sketch, the participants look at the other sketches. I ask them to identify the details that make the sketched object recognisable. There isn’t time to draw a high-fidelity rendering, so the sketches are rough and have few details. Interestingly, with few details the sketched objects are still clearly recognisable. Participants learn that detail and fidelity aren’t needed. By the last round of sketches—the “2 seconds to sketch a house” round—participants have seen that everyone’s ability to produce sketches is about equal, and they usually conclude: “I sketch well enough for others to grasp my ideas.” Generative design requires lots of ideas—disposable ideas—not fancy drawings. Jason Santa Maria says a similar thing in his Pretty Sketchy blog post, in which he declares that sketching is not about being a good artist; sketching is about being a good thinker. Are *five* sketches too many? I first heard Bill Buxton talking about sketching in Texas, at the UPA 2007 annual conference. I was running around with a video camera asking people what they thought of Bill Buxton’s presentation. Everyone loved it, including his ideas on sketching and design. But almost everyone I spoke to also said Buxton’s requirement for five sketches was several sketches too many. It’s a good question. Buxton also had an answer. “Doing multiples is critically important” because it’s how you saturate the design space with enough ideas to rapidly iterate to the best design solution. The challenge, says Buxton, is to balance “doing multiples” with the budget, with dollars, time, and personnel. It comes down to technique. Sketching is a fast, inexpensive, and therefore disposable way to capture ideas. And five really is key. In my experience, when I asked design participants for two or three sketches, they each brought “two”—actually versions of the same sketch where one had an extra squiggle or mark on the page. This is not how you saturate a design space. It has to be at least five—hence the name, Five Sketches™. The sketches have to be fast. They have to be low fidelity. The sketches have to be disposable. 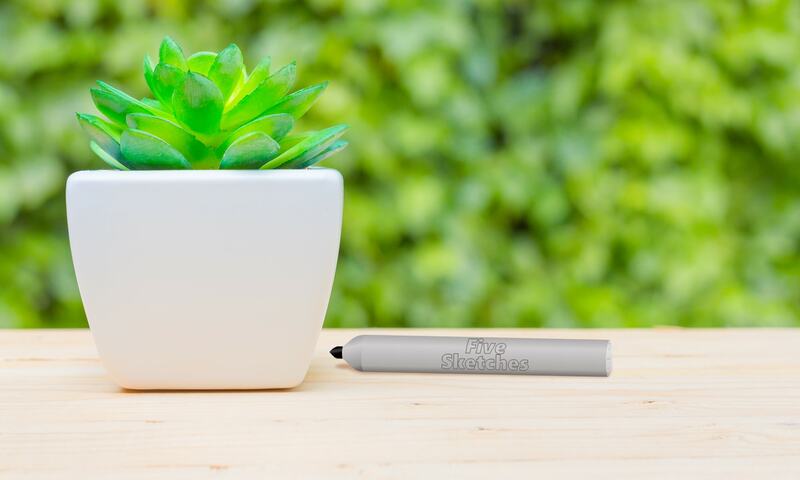 Sketching is the right tool. You also need the right team, working at the right time. The right team has an understanding of generative design and knows that there’s a time to sketch, a time to iterate and analyse design ideas, and a time to code or program. (A team of three or four design participants can learn and practice everything but the programming in a half day.) In my experience, design participants—developers, QA staff, marketing staff, support staff—can sketch and produce great software and web designs as effectively as a graphic designer or industrial designer can. Again: it comes down to technique. And since sketching is cheap, you can’t afford not to design. When solving a software-design problem or a web-design problem, you get the best results from following a design process. I’m not referring to something I made up. I’m referring to something that people who are trained in “Design” will recognise as a design process. And such processes inevitably include divergence and convergence. 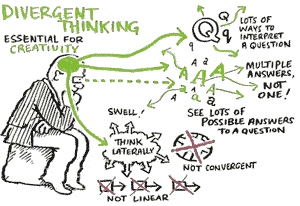 Divergence is the stage when the designer or design participants come up with ideas. Lots of ideas. Not just comfortable ones, but ideas that push at the edge of the envelope. Ideas without judgement. Convergence is the stage when ideas are judged, rapidly iterated, assessed, and checked against the requirements. Sketching on paper with a wide-nib pen is best because this “technology” is familiar—it’s easy—and inexpensive. Everyone can have a pen and paper, so there’s no need to wait your turn. Sketching is fast, so designers have little invested in any one sketch. Modifying or iterating any one of the ideas is easier to accept. Most importantly, for inexpert sketchers, the sketching process intrinsically discourages high-fidelity work and the wide-nib pen discourages sketching the fine detail that detracts design participants from getting the ideas out, fast. Software that’s intended to help people “sketch” detracts from a good result. The software often lets users build prototypes with a great level of interaction detail. The problem with this: attention to detail is a distraction at the divergence stage. When filling the design space with ideas, it’s sufficient merely to evoke the idea and share it. Ambiguity actually helps the team see more than one idea in the same sketch; each interpretation of the idea can be iterated. Software that’s not intended to help people to “sketch” slows them down at the divergence stage—just when we need ideas to flow quickly. Divergence is about filling the design space with lots disposable ideas. Read my blog post about why ideas are disposable. Having a good design idea is not an amazing event. People have good design ideas all the time. What is amazing is having lots of good design ideas, so that they can be combined and iterated into the best possible design. Sketching lets you capture lots of ideas, quickly and inexpensively. The more ideas you try for, the sooner you learn that it’s easy to come up with five or more ideas. The easier it gets to have lots of ideas, the sooner you realise the value of any one idea is minimal. This is one of the keys to the success of Five Sketches™. Once you learn how easy ideas are to have, you can saturate the design space, iterate the design, and produce excellent design outcomes at will. There’s been a loss of usability for people who type text. After typing a long message in Facebook, when I click send, I get a page error and my entire message is lost. After typing a post in WordPress, if the server has gone down or I press an unintended keyboard shortcut, I lose my entire post. By comparison, if Word stops responding, it will (try to) offer me my unsaved changes when I reopen the document. With users increasingly doing their work in browsers, why don’t browsers remember the text we were typing? Or why doesn’t the operating system? Or why doesn’t the weblication make backups? Or the server? This hints at just one possible solution. In the spirit of Five Sketches™, I bet you can come up with at least five more ways to support users after they’ve lost the work they typed in a browser. Leah Buley talked about generative design at the South by Southwest Interactive conference, today. Buley feels design methods are lacking in the set of professional tools we use for software development: “We don’t have so many good, reliable, repeatable design techniques.” I agree with her. Buley tells how, in her first design session at Adaptive Path, she was handed a pen and paper, and told to sketch. The point was “to crank out a lot of ideas in a short time.” That’s what generative design is all about: saturating the design space with ideas. Design programs teach generative design, but there’s no generative design taught in programs for developers, QA staff, technical communicators, product management, or marketing. There are already several design methods for software development teams to choose from, including Buley’s wonderful grab bag. Others I know of are Five Sketches™ (obviously) and Design Studio, both of which focus on the complete process of producing a design, start to finish, with all its challenges. Microsoft’s Bill Buxton told the UPA 2007 conference that he insists on generative design, and I’d love to see that in action. Each method differs slightly, but they all work because…. Why do they all work? Because of generative design. Generative design addresses what Buley calls her “dirty secret.” She freely confesses, about her design work before Adaptive Path: “I had very little confidence that what I was presenting as the design was in fact the one, optimal solution to the problem.” My experience teaching Five Sketches™ tells me that once you’ve participated in a generative-design process, you’ll know that you can have that confidence. A tangential question: when will computer science programs teach Basic Design Methods?